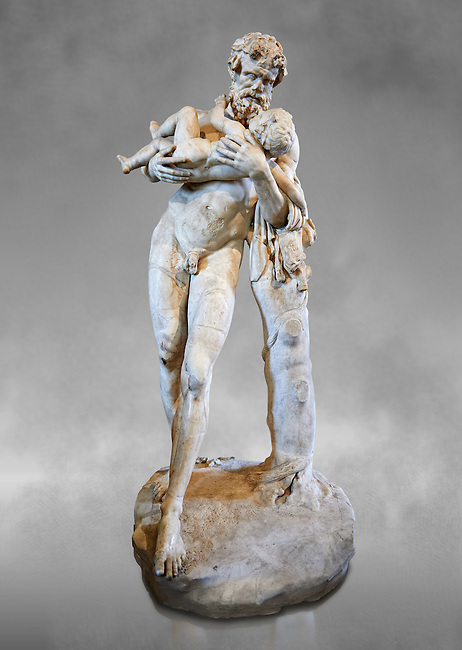 Silenus (Faune to the Romans) and The Child ( Dionysus, Bacchus to the Romans). A 1st - 2nd century Roman statue in marble discovered in the gardens of the Salluste in Rome, Italy. Silenus was ordered by Zeus to take his illegitimate son son Dionysus away from the wrath of Hera to the nymphs. This staue is a Roman copy of a lost bronze Greek original by the 4th century BC Greek sculptor Lysippos. From the Borghese collection, Inv MR 346 (or Ma 922), The Louvre Mueum, Paris.